Wide Open Spaces integrates Unbound Commerce and Magento for its m-commerce site. Customers of members-only flash sale e-retailer Wide Open Spaces are often quite far from a PC. They’re hunters and fishermen who like good deals. And they needed a way to keep track of flash sales while in the great outdoors. So Wide Open Spaces built a mobile commerce web site. – Unbound Commerce announced today that a broad index of 200 retailers using its Mobile Presence platform to power their mobile commerce sites saw record increases in both traffic and sales volume metrics, in year over year same store comparisons for March/April 2013. The new m.ShopMillerBrewing.com mobile site features branded merchandise from nearly 20 top beer brands, including Miller High Life, Foster’s, Peroni, Miller Genuine Draft, Grolsch, and Pilsner Urquell. Now, mobile site visitors of legal drinking age can browse and shop for products from their favorite MillerCoors beer brand, and checkout, right from their mobile phones. Mobile customers can also share the products they discover on the mobile site with their friends via Facebook, Twitter and email links. The backend platform also allows MillerCoors to build campaign-specific mobile landing pages and link these pages with marketing materials via a QR code generator feature. “We saw the growth of mobile commerce and wanted to get involved. Since nearly half of all Americans now own web-connected smartphones, delivering a site experience optimized for mobile visitors to our website made a lot of sense,” said Laurel Cunningham, Consumer Licensing Director at MillerCoors. MillerCoors brews, markets and sells the MillerCoors portfolio of brands in the U.S. and Puerto Rico. Built on a foundation of great beer brands and nearly 300 years of brewing heritage, MillerCoors continues the commitment of its founders to brew the highest quality beers. MillerCoors is the second-largest beer company in America, capturing nearly 30 percent of U.S. beer sales. Led by two of the best-selling beers in the industry, MillerCoors has a broad portfolio of highly complementary brands across every major industry segment. MillerCoors operates eight major breweries in the U.S., as well as the Leinenkugel’s craft brewery in Chippewa Falls, Wisconsin, and two microbreweries, the 10th Street Brewery in Milwaukee and the Blue Moon Brewing Company at Coors Field in Denver. The MillerCoors vision is to create the best beer company in America by driving profitable industry growth. MillerCoors insists on building its brands the right way through brewing quality, responsible marketing and environmental and community impact. Please see www.MillerCoors.com for more information. Unbound Commerce is the leading solution provider for retailers and brands seeking to capitalize on the booming adoption of mobile and social commerce by consumers. 360+ retailers currently use the Mobile Presence® platform, and the Mobile Commerce Data Book from Internet Retailer identified Unbound Commerce as the #1 mobile commerce solution provider in the space. Retailers of every size choose Unbound for integrated mobile commerce sites, commerce-enabled apps, tablet commerce sites and apps, and Facebook stores. For additional information, please visit http://www.UnboundCommerce.com. – Leading rug and home furnishing retailer RugsUSA has risen to the top of the online field by offering a wide variety of products at great prices— using special promotions, free shipping and exclusive discounts to drive awareness and traffic. Today, RugsUSA is pleased to announce they have extended their reach into the booming mobile commerce space via the launch of m.rugsusa.com. The new integrated mobile site is designed to capture the here-and-now power of mobile and provide a mobile experience for web traffic increasingly originating from smartphones. RugsUSA has an increasingly mobile customer base and wanted to allow their customers to try on the best possible mobile commerce experience. According to Koorosh Yaraghi, CEO at RugsUSA, “our new mobile site lets us connect with customers while they are rug shopping in traditional stores.” By bringing their offerings into the bricks-and-mortar settings, RugsUSA can offer their well-priced products to customers at the times they are most likely to purchase. The new mobile site includes RugsUSA’s promotional offers and product-specific social media linkages. Customers can also share product details by email. Registered customers get streamlined checkout by signing in and having their address information automatically entered for them. Leading mobile commerce service provider Unbound Commerce released numbers today showing the impact of Cyber Monday on aggregate mobile commerce transactions. Total revenue generated by retailers utilizing Unbound’s integrated mcommerce platform surged 410% on Cyber Monday, as customers reached for their smartphones to shop and covert purchases in record numbers. Rockport’s new mobile site features the entire Rockport line of shoes, boots and accessories and allows consumers to shop and checkout, all from their smartphones. Powerful features have been integrated into the mobile commerce platform by service provider Unbound Commerce, extending and leveraging the current Rockport ecommerce infrastructure. And now Rockport has integrated Google Wallet as a payment option on its mobile site to streamline the mobile checkout process for its customers. Selected as a launch partner, Rockport was featured in a recent announcement about the new Google Wallet solution for the mobile web. Cavender’s Boot City has a new mobile site, delivers topnotch service to customers. Mobile commerce solution built by Unbound Commerce. Cavender’s Boot City, a leading retailer of western apparel, has launched their new mobile commerce site, powered by Unbound Commerce. 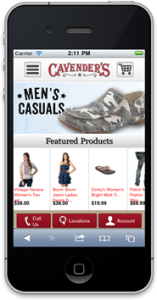 Customers with smartphones can visit http://www.Cavenders.com and automatically get a mobile-optimized experience, including full catalog, online purchasing and directions to the nearest store. Unbound Commerce today announced that it will participate as a Google Wallet platform partner. Unbound is now authorized to deliver Google Wallet checkout functionality in the context of the mobile commerce sites that Unbound builds and deploys for leading national retailers and brands. Visitors to mobile commerce sites displaying the Google Wallet button can use Google Wallet to checkout, which can reduce friction during the cart interaction process. Mobile consumers who use Google Wallet do not have to type in their shipping and billing information, credit card number, etc. Google Wallet users simply type in their Google usernames and password to pay, which can increase conversion rates and customer satisfaction. Partner retailers and brands can retain their existing payment processors since the Google Wallet API that Unbound has access to is integrated into its mobile commerce site offering. Best of all, there are no additional fees for accepting Google Wallet on a mobile commerce site, and all payments are sent through the existing credit card processor the retailer uses. “We are always looking for new ways to streamline the consumer interaction flow for our retailers and brands and are pleased to join forces with the Google Wallet team,”said Wilson Kerr, Unbound’s VP of Business Development & Sales. “Google does not do anything in a small way and we believe they will be a strong force in the mobile payments space. Our retailers are embracing this single click checkout option and we have multiple large brands committed”, he added. Unbound Commerce is the industry’s #1 provider of mobile commerce solutions, for Retailers seeking to reach their customers anytime and anywhere. The 2011 issue of the Mobile Commerce Data Book from Internet Retailer shows Unbound Commerce as the #1 mobile commerce vendor, with an industry-leading number of mobile commerce site deployments. Unbound Commerce’s approach also delivers a social commerce store for Facebook, allowing consumers to buy where they connect through social media, as well as commerce-enabled iPhone and Android applications and in-store tablet-based mobile commerce. For additional information, please visit us athttp://www.UnboundCommerce.com. Top mobile commerce solution provider Unbound Commerce today announced the launch of a new program called Digital Pop-Up Stores (DPS). This new feature allows commerce functionality to be infused within a mobile landing page or digital ad. What differentiates the program is that, for the first time, rich product detail options like style, color and size can be selected by consumers, without leaving the mobile page or ad or refreshing the page. The order is then dropped deep within a retailer’s mobile commerce checkout flow. This increases conversion rates and allows merchants to assign sales conversion metrics to ads or mobile landing pages, including Facebook ads. Because the page does not need to connect back to the mobile commerce engine behind it until the end of the consumer interaction, the experience is smooth and fast for mobile consumers. “DPS is a powerful new way for our clients to both drive sales and measure ad effectiveness at the same time. Not just by clicks or by impressions, but by actual mobile sales conversions that can now take place within the ad. We feel this could be a game-changer”, said Srinivasarao Nandiwada, Unbound Commerce co-founder and CTO. When combined with the QR code generator in the dashboard all Unbound clients have access to, any ad, point of sale, or printed packaging can become the trigger for a pop-up store for mobile customers, at virtually no cost. 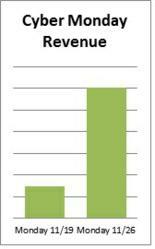 This links mobile commerce and mobile marketing in a powerful new way, and tracks the resulting sales. Unbound Commerce provides a platform solution to retailers and brands seeking to capitalize on the booming consumer adoption of mobile and social commerce. 325+ retailers currently use the Mobile Presence® platform, and the Mobile Commerce Data Book from Internet Retailer identified Unbound Commerce as the #1 mobile commerce solution provider. Retailers of all sizes choose Unbound for mobile commerce, commerce apps, tablet commerce, and Facebook stores. Unbound’s unique integrated approach requires as much or as little IT involvement as desired. For additional information, please visit us at http://www.UnboundCommerce.com. Unbound Commerce today announced it was named by third party mobile performance measurement service Marlin Mobile as the mobile commerce solution for retailers with the fastest page load times. As compared to transcoded (“screen scraped”) sites or those built using responsive design, integrated mobile commerce sites built by Unbound Commerce outperformed the field by a wide margin. The benchmark study conducted by Marlin Mobile measured load times from 500+ Android devices on a variety of Carriers.Marlin Mobile performed this study on integrated, transcoded, and responsive design sites used by top retail brands in the apparel, accessories, and sporting goods spaces.